Upcoming sale marks 100 years of beef breeding at Penn State. Penn State's College of Ag Sciences will celebrate 100 years of breeding Angus beef cattle with a production sale on Oct. 21. The regular production sale, held every three to four years, will be at the Beef-Sheep Complex on Orchard Road near the University Park campus. The sale includes 49 lots of 84 cattle, including bred cows, cow-calf pairs, bred heifers, weaned heifer calves and weaned bull calves, says John Comerford, Extension beef specialist and coordinator of the university's beef program. The cows and bred heifers are sired by leading sires in the breed. The offering of cattle in the sale represents a cross-section of the cow families in the herd. YOUR NEW PLAYMATE? 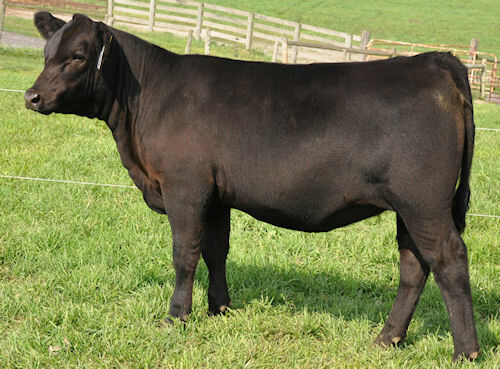 March heifer calf P S Playmate 859 133 will be one of the animals offered at the October 21 sale. "They're bred to outstanding bulls from across the country," he adds, "focusing on important economic traits, particularly lower birth weights, above average growth, and superior carcass data. Use of popular sires enhances marketability. "Breeding decisions are made primarily using expected progeny differences for the traits of interest, with minimal use of genetic markers," emphasizes Comerford. "Phenotypic response to Expected Progeny Differences is consistently better than from markers." "We are very proud of the tradition we have at Penn State for the production of high-quality Angus cattle," said John Comerford, associate professor of dairy and animal science and coordinator of the university's beef program. "This sale marks a milestone for breeding Angus cattle while providing an important educational opportunity for our students and a resource for beef-production research over the past century." learning -- from industry leaders around the country -- several other methods of marketing beef cattle, including feeder-calf and fed-cattle marketing, international marketing, cattle photography, promotion in niche markets and customer communications. Information about the sale, including a complete digital sale catalog, will be available soon on the American Angus Association website at http://www.angus.org. For more information on sale entries, contact Wendall Landis, Penn State's Beef Farm manager, at 814-863-0831.